French and Chadian airstrikes have allowed the Chadian army to take some 250 rebels into custody. The rebel group had been making its way into Chad from Libya in a convoy of about 50 vehicles. The Chadian military on Saturday said it had captured more than 250 rebels, including some top leaders, after an operation against a convoy of militants trying to cross into the country from Libya in late January. The army said in a statement that it had captured the rebels from the Union of Forces of Resistance (UFR), a Libya-based rebel coalition that is trying to topple President Idriss Deby, and destroyed more than 40 of their vehicles. 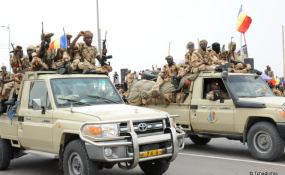 The rebels had driven about 50 pickup trucks more than 600 kilometers (370 miles) into Chadian territory without any significant obstacles before facing several days of French and Chadian airstrikes. France's military said on Wednesday that its warplanes had destroyed about 20 pickup trucks after a request from Deby for support. Deby on Thursday confirmed that the column of rebels had been "destroyed" in a series of strikes carried out by French warplanes. The UFR rebel group said it had suffered "damage" after the French strikes, according to one of its members Mahamat Doki Warou, while another source from the group told the AFP news agency that 10 fighters had been killed. Chad is home to more than 200 ethnic groups and has suffered repeated coups and crises since it gained independence from France in 1960. The UFR was created in January 2009 from an alliance of eight rebel groups. Its creation came after a tripartite insurgent group, moving in from the east, reached the gates of the presidential palace in N'Djamena in February 2008 before being fought off by Deby's forces.